Claude Perry Obituary - Rising Sun, Maryland - R.T. Foard Funeral Home, P.A. Obituary for Claude "CA" Perry, Jr.
Claude "CA" Allen Perry, Jr. of Rising Sun, MD, age 76, passed away Friday, April 5, 2019. He was born on December 14, 1942 in Smith county, VA to the late Claude Allen Perry, Sr. and Kate (Johnson) Perry. CA graduated from the Oxford Area High School, and later in life earned at Bachelor's Degree from Cecil College. He worked for Air Products and Chemicals for 49 years before his retirement in 2011. 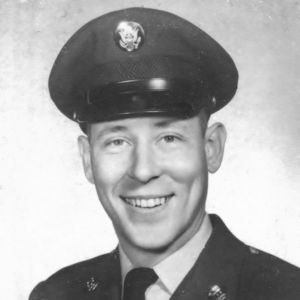 CA was very proud to have served his country in the United States Army during the Vietnam War as an Airborne Sensor Specialist. He was a member of the Vietnam Veterans Association as well as the American Legion Post 194 in Rising Sun, MD. CA enjoyed woodworking, having handcrafted numerous walking canes, dollhouses, churches, and barns, all with exquisite attention to detail. CA was opinionated and outspoken, saying what he though in any situation. Given that he loved to talk and had a huge heart, he could make friends anywhere and everywhere. CA's most cherished time was spent with this family, whether it was going to car shows with his "#1 grandson" or eating ice cream at Rock Springs with his granddaughters, he was proud of all of his family. A celebration of CA's life will be held at 12:00 pm on Friday, April 12, 2019 at R.T. Foard Funeral Home, 111 S. Queen St., Rising Sun, MD 21911, where family and friends may begin visiting at 11:00 am. Burial will follow at West Nottingham Cemetery. In lieu of flowers, memorial contributions in CA's honor may be made payable to "American Legion Post 194" and sent in care of R.T. Foard Funeral Home, PO Box 248, Rising Sun, MD 21911. Thank you to everyone that has messaged, called, stopped by and offered your support, love, prayers, and kind words during this difficult time. We appreciate you all. Please enhance this tribute to CA by adding your memories and photos.